VINEYARD GARDENS NURSERY IS OPEN FOR THE SEAON! We are excited to announce we are back open and ready for another wonderful year! We have been busy in our greenhouses planting and germinating seeds since the end of February and our cool weather vegetable packs are now ready! Get a head start by planting a few rows of our fabulous pack greens and then plant another row of seeds a few inches away. We have both Fedco and Botanical Interest seed packets for sale in our store. Fedco is a seed company located in Maine. They are known for their fabulous vegetable seed selection. Botanical Interest is known for their beautiful seed packets and wealth of information. By combining the planting of both seeds and seedlings it will allow you to have a staggered harvest and two batches of fresh vegetables. It’s all about timing! Plant all your cool weather vegetables early! We have a wonderful selection of cool weather crops including broccoli, cabbage, 5 kinds of kale, 4 kinds of mustards, 8-10 kinds of lettuce, Asian greens, Chinese cabbage, tatsoi, bok choy, spinach, lettuce, arugula, several mesclun greens. asparagus and strawberries. We also have peas in peat packs, sugar snaps, snow peas and dwarf grey peas. The dwarf gray are known for being delicious as pea shoots, harvesting the tips and eating them in your salads. The snap peas are for harvesting the pea inside the pod. The snow peas are best picked young and steamed or sautéed whole, you eat the entire pod. If the snow peas get too big eat the pea inside. Nothing goes to waste and don’t forget to compost! EAT LOCAL GROW IT IN YOUR OWN BACKYARD! 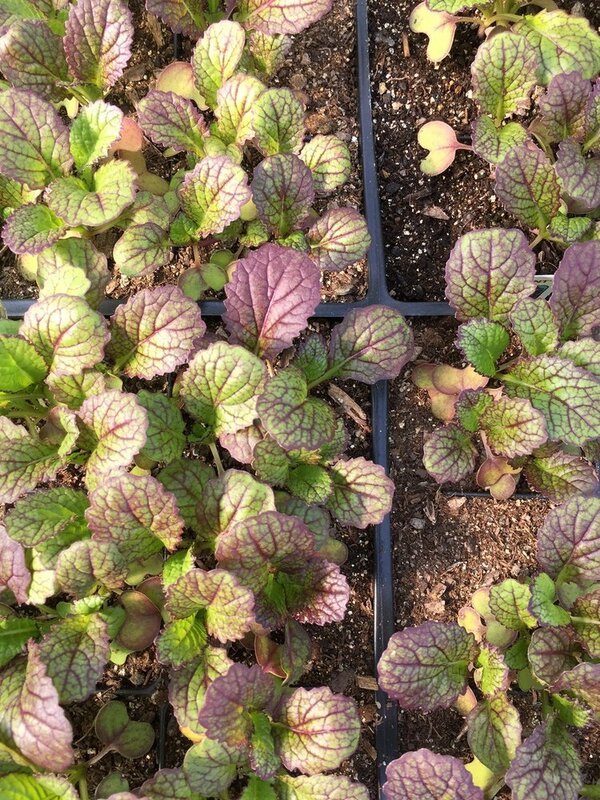 Vineyard Gardens greenhouse: Our germination process of cool weather crops.